The company’s adjusted earnings driven by strong performance in its Pharmacy Services segment also rose marginally to $5.90 per share in 2017, from $5.84 in 2016. 2017’s adjusted earnings exclude $1.5 billion income tax benefit from U.S. Tax reforms and Jobs Act (TCJA). Looking ahead, the company is now forecasting a -1.5% to +1.5% growth in its operating profit for the year, a reduction from its earlier 1-4% forecast. Please refer to our dashboard analysis on CVS. Revenue for its Pharmacy Services segment grew by 9.3% y-o-y to $34.2 billion in the fourth quarter driven by the rise in pharmacy network claims, brand inflation, and growth in specialty pharmacy. This segment includes the pharmacy benefits manager business and specialty pharmacy services. In its Retail/LTC segment, revenues increased more modestly by 0.9% to $20.9 billion driven by moderate increase in same store prescriptions and brand inflation. 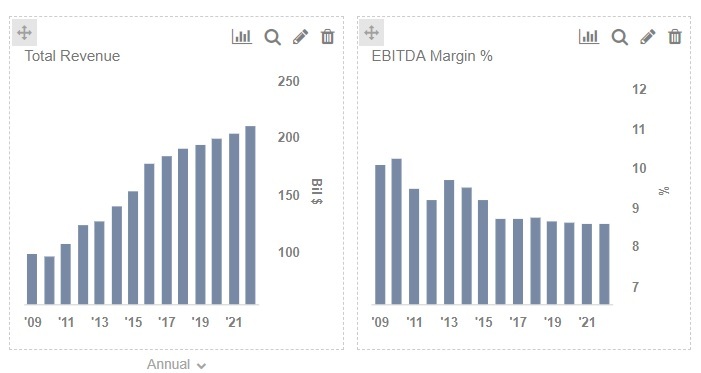 Given that the company started 2017 with lost contracts from the Department of Defense and Prime Therapeutics to its rival Walgreens, it recovered well during the year to post this growth. The company took several measures to counter the loss of contracts including expansion of its ongoing partnership with Optum and the offer of bundled service offerings to its customers. Focus on store rationalization and optimization of delivery platform also helped improve productivity. We anticipate CVS to continue its healthy growth momentum in 2018 with a rise in the top line. Management forecasts more cautious full year 2018 adjusted operating profit growth in the range of between -1.5% to +1.5%.